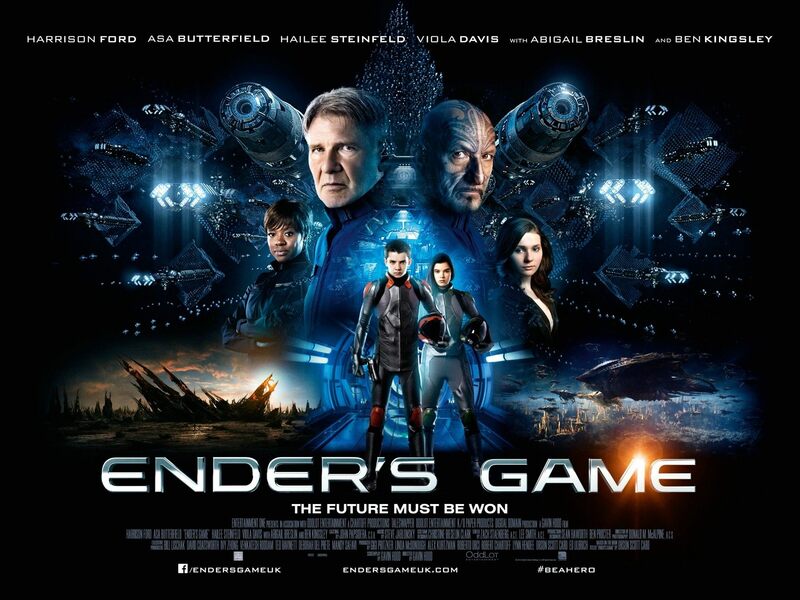 On Friday afternoon, I rushed out of the office to the movie theater to catch the 5:30 showing of Ender’s Game. I apologize that this post comes so late. I didn’t have enough time to draft my review until now. I’m sure many of you have been anxiously waiting this post (kidding, of course). And so, your wish is my command, dear readers! I know there is a lot of controversy around this film due to the unpopular opinions concerning marriage that the book’s author, Orson Scott Card, has offered to the public recently. But I have been waiting for someone to make this book into a movie since I first read it in middle school. I am neither a huge sci-fi junky nor a member of the military, but I distinctly remember turning to the last page all those years ago and thinking, “Man this would make one fantastic movie!” And then, the arduous fifteen-year wait began. I’m sure technology had to catch up to be able to depict the imaginings of the story. And lucky for us, it finally has. Usually I enjoy seeing books turned into film, even though I am more often disappointed in the transformation than not. But I understand that the transference between book and film mediums is difficult. With words on a page, you can imagine anything. There is no budget to constrict what you can dream up. Also, you aren’t limited by the two-and-a-half hour time frame within which you must tell your story to completion. Keeping these factors under consideration, I was pretty satisfied with what we were presented with in the theater on Friday afternoon. There is also something to be said for the way I imagine the author’s words and the way a director interprets them and features them on the reel. I don’t often sync up with the director and thus am frequently disappointed in the product. 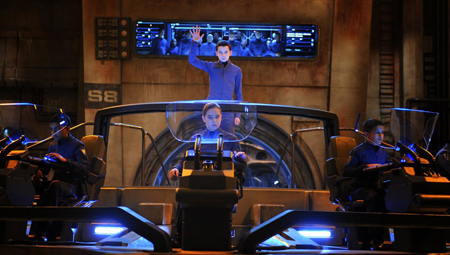 As for Ender’s Game, I thought the visual elements of the film were excellent. Seeing the characters manipulating the technology truly solidified the reality for me as a viewer. I had always imagined what the tools would look like and I wasn’t disappointed with the filmmaker’s interpretation. I’m not a huge sci-fi buff, but I love space. I love watching space movies and if I ever had the opportunity to go into space, I would jump on it in a heartbeat. I may be a little biased, but I think Carl Sagan (or maybe just the script writer) had it right, poets (and writers in general) belong in space. No one else can convey the feelings a person would experience while witnessing zero gravity and seeing the moon and the stars relatively up close to those who have not had the privilege better than a writer. Hinty hint hint, NASA! I was also pleased with the acting. Ender is a rather emotional individual and finding a balance that works and is believable is particularly challenging. Ender is a child, an emotional one at that, who is a genius and in training to be the commander for an attack on a “hostile” alien race. Additionally, there is the stigma that many male children must deal with, the debate about whether it is okay for a boy or man to be emotional. I was pleased with the path that Asa Butterfield took with the character. I thought the emotion he expressed suited the character and was quite appropriate. Plus, he can cry on command. That’s impressive! The director and the producers also faced an additional difficulty of finding children who could fill the roles of geniuses properly. In the original story, (if I remember properly) I think Ender is supposed to be about ten years old. I believed that to be successful with this story, they would have to skew the age of the children a little bit and pick actors who were slightly older. But you couldn’t take it too far or you would lose the support of the fanboys and girls. 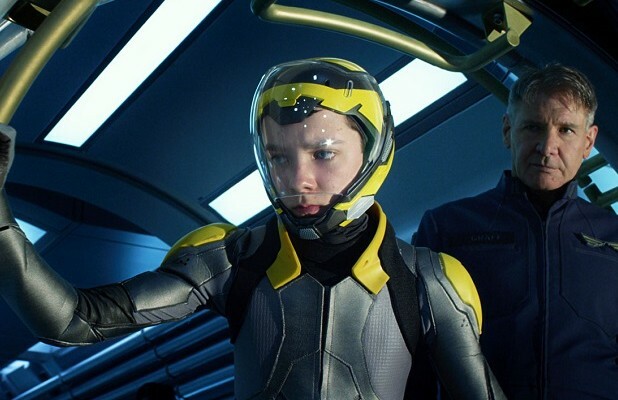 I know nothing about Asa Butterfield, but if I were to guess, I would hypothesize that he is anywhere from 12-15 years old and I thought he suited the part very well. As far as plot goes, I thought they followed the book pretty well. There were some significant changes. They made Bean a launchie in Ender’s class. This is incorrect. Bean is supposed to be at least one, maybe two, classes behind Ender. They made this decision of course due to one of the constraints listed above: time. They also left out the really significant roles that Valentine and Peter play in the story. I know they do this again because of the limitations of time. But I was disappointed that Ender’s siblings weren’t a bit more involved. They hit on Ender and Valentine’s relationship. But since you don’t really see much of Valentine, you have to take it’s reality on faith. If you haven’t read the book, you may not be so inclined to believe they are as close as Ender seems to think. The scene where Valentine comes to Ender on the lake feels very manipulative since the audience misses out on a lot of the history. In case you don’t believe in the relationship between Ender and his sister, they pumped up the relationship between Ender and Petra. They also got as close as they could to a relationship. I’m glad they didn’t take it too far. But they did tone down Petra a bit. She’s much more of a badass in the book. The friendship between Ender and Alai is not particularly well-developed which is unfortunate because it is such a significant thing for Ender in the book. Of course, the filmmakers had their reasons. But as a book person, I tend to be a purist. But, despite the shortcomings, the film reminded me again of what it was I loved about the original story. Ender’s Game is a story of war. But it is so very different from the other stories out there. Yes, you have your reluctant hero who has abilities that he simultaneously relies upon and loathes. The story expresses the way that right and wrong are twisted in war. But Ender keeps his head straight. He doesn’t see his actions as glorified. He sees them as murder. The film depicts this perfectly and I have to give major credit to the script writers because Ender’s declaration that “[he] shall bear the shame of this genocide forever” is perhaps the best line I have come across in film in a very long time. It perfectly depicted his agony and is a great reminder to all that the enemy is a living being. It is not a game. Life is life. No matter if it belongs to the enemy or a friend. I had chills as i sat there, I’m willing to admit. There are a number of positives and a few negatives that you will experience if you see this film. Obviously, I have been a fan of this story for a long time. For me, it was great to finally see it translated into film, despite the alterations that were made. I definitely recommend seeing this film. If you haven’t read the book, I think you can still enjoy it. I attended the screening with a friend who had not read the book and he seemed to enjoy it just fine. Hopefully this is the beginning of a great wave of holiday films! Writer out! Great review. Thanks! BTW, did you see the movie in 3-D? Thanks! We saw it in XD. Not 3-D. I bet 3-D would be fun though!